A Site Devoted to the Discovery and Application of Emerging Technologies . Retired from Procter & Gamble after 27 years. Now consulting extensively. Background in mathematics, working on a wide variety of modeling, supply chain, analysis, expertise, business intelligence and social media applications. Contact at: Franzdill AtSignHere Gmail.com ShortBio Here. Second Life For the Enterprise? Less is More: Private Label Implications? Dave Knox points to a slide presentation at the recent Virtual Worlds conference on Social Gaming and virtual goods: Virtual Goods in Asia. Very useful statistics. Again useful hints about how to provide incentive for complex tasks. Thinking that some of these ideas could also be used to alleviate some of the seriousness of the enterprise and replace it with unbridled creativity. A good overview article in Forbes on Neuromarketing. ' ... Yahoo, Hyundai, Microsoft and other marketers use EEGs and MRIs to vet commercials, packaging and product design ... ' . Makes a good case for the increasing use of this technology. Many companies are exploring. Mark Montgomery points me to the Semantic Web site, which I need to put on my feed. They mention the WolframAlpha IPhone App there, which I also noticed here. More of a site that covers semantic Web news. In particular also an article: Explaining the Semantic Web, which has links to other introductory SW sources. Another article talks about funding startups in this area. Mark's own effort, Kyield, is a notable Semantic Web startup that looks at enterprise knowledge. A piece on the relationship of statistical/engineering approaches versus design. Was also discussed in the NYTimes. As an engineer/scientist I know more about that approach, but there is clearly a need to mix the two. My concern in that design principles are two easily 'blinked' into accreditation, and the result adds to the executive intuition effect. There should be a balance. Roger Dooley on recent scent dimension work in marketing. A frequent topic here. Most recently we talked to Whiff! about establishing scent laboratories. Scent has always been a powerful dimension, but it has been problematical to deliver effectively in retail. That is why there are few olfactory strategies for marketing. Brand Futurists, like Martin Lindstrom, do understand its power, emphasizes it in his book Brandsense. A number of tests were run in our innovation centers and allied retail spaces. Also useful: The Whiffbook, devoted to the topic, the Scent Marketing Institute, a good means to follow this area, the Whiff site and the Scent Marketing Blog. Another case study, here concerning big CPG in Asia, Unilever is using a number of methods, especially in beauty brands using Facebook based activities and engaging bloggers. From the 2nd Annual UC Marketing Summit: The Challenge of new media. If you missed it, you still have a chance to hear Ken Lowe, 2009 UC Marketing Summit keynote speaker and President & CEO of Scripps Networks Interactive, speak about the rapid evolution of new media technology. OR/MS Today has published its yearly Simulation software survey. Always surprised that people who want to create useful virtual analyses don't know about this analytical resource. A number of useful updates in Google Analytics. I am reviewing. Josh Bernoff provides an overview of the recent Forrester Groundswell Awards: Why Anyone Can Create a Successful Social Application. Case studies like these are good, but I would like to see more details, with more complete and common business metrics and some longer-term data. That would greatly help with the 'no excuses' point. From Paul Gillin: Brand Marketing Due for a Makeover.' ..."Adaptive Brand marketing starts with the environment -- customers and a deep understanding of their needs and behaviors -- and then designs the most appropriate channel mix for engagement," she writes in a sentence that nicely sums up the thrust of this research. "Spending and planning decisions are daily -- not annual -- events." ... ' . Recently I took a first look at Zakta, a novel form of search engine that includes the ability to work socially with your searches, edit them, manipulate and use them as a means for knowledge-based collaboration. To me it's much closer to Vannevar Bush's original view of a search and knowledge based system. I got the chance to talk to Sundar Kadayam, their CEO, today. I also recently looked at Google's social search and found it to be uninspiring, it just didn't get many additional useful answers. Kadayam showed me how Zakta can save you considerable time doing searches, plus adds the ability to edit and easily share the results by adding processes called Guides to formalize the process of your research. You can also point to these Guides from your blog or site. I will experiment with that in the coming week and give an example here. Kadayam has written a blog post which further outlines the value of socially augmented search. While on the blog check out some of their examples of Guides, to understand how it goes beyond mere search. Check out their Beta site. You can compare your results side-by-side to Google and Bing. The layering capability, which categorizes your results will alone save you time and help you organize your thoughts when searching. A good case study about P&G using Facebook to market Crest Whitestrips. '... the contest on Facebook asks participants to submit stories about connections they wish to make over the holiday season, for the chance to win a visit to those people. The Procter & Gamble brand is offering a daily sweepstakes around the connections theme and is encouraging people to pass along the promotion on Facebook ... '. See also the Crest Whitestrips Facebook site. A piece in Language Log talks about the universality of irony in communication. Also links to a number of other discussions previously held on the topic. One way to look at irony is as a form of inefficiency in communication, alternately as a means of emotional engagement. Here are Ben Shneiderman's slides from his keynote at the 2009 HCIR conference, posted by Daniel Tunkelang, worth a look. A colleague pointed me to compete.com from TNS, which acquired them last year. With a trial version of the package you can compare traffic at major web sites. Also includes a number of basic normalized metrics for sites. Quite informative. Advanced versions of the package, with many additional capabilities, have a monthly subscription fee. Simple, nicely done.
' ... presents some really intriguing findings about when and why we blink and how blinking patterns provide important clues about what we find interesting and what we implicitly decide we can miss. First of all, blinking is a big interrupter in our visual processing regimen. The authors estimate that about 10% of total viewing time is lost to blinking. So we should not be surprised to learn that we blink somewhat strategically, albeit nonconsciously ... ' . Read the rest, very insightful. I joined the Google Social Search experiment. When you do, any time you do a search in Google it adds information and results from your social network. It gets network information from public information about your network found in Twitter, Friendfeed and your GMail chat list. Not from Facebook, since friends there are not public. Although it uses this information it does not display that network in any way. I have tried it a few times, but nothing interesting yet. Nice idea, with the usual privacy nervousness. A video overview. For a proposed project I am examining flocking methods to build spatial clusters. Flocking/Herding is the regularly observable activity of animals like birds gathering in groups. Birds likely do not form flocks by doing strategic planning, but rather by using simple individual behavior whose overall interaction results in clusters with a useful emergent behavior. Can the resulting biologically inspired method be used to solve other clustering problems? Here is an example of such a method. Alex Williams of ReadWriteWeb talks to IBM about ' ... developing analytics platforms to help companies better understand how multiple pieces of information fit together to create rich forms of business intelligence ... ' . Includes an intriguing interview with IBM's Jeff Jonas, very high level with emphasis on real time data requirements. Thin, but a good thought. A good overview of the recent Human-Computer Information Retrieval HCIR workshop this past week. This is such an important topics and it is good to see increasing interest in this topic. My own strong sub interest, of course, is how to use useful visualization to make this as easy as possible and how to make the process essentially interactive. Never been to one of these meetings, but I think it would be useful. More background on HCIR. If you like what you read here take the time to add this blog to your RSS feed. Don't use RSS? Its a great way to make your Web reading more efficient. More about that here. I use Google Reader, but there are many options. In addition, many of my posts here, plus others in the same vein are linked to on Twitter. My name there is @FranzD. You can preview my recent posts in Twitter here and follow if you like. Len Kleinrock on the 40th annoversary of the Internet in IEEE Computer: A Revolution Forty Years in the Making. Of interest, the Flare library, from the UC Berkeley Visualization Lab. 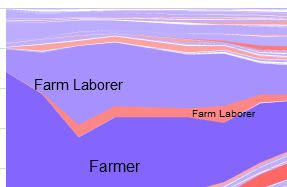 Contains a number of visualization capabilities, an example is the Job Voyager, demonstration here, which does a stacked visualization of job titles over time. Similar to the well-known Name Voyager, which visualizes given names over time. The library contains a number of other open-source, useful and innovative Flash scripts. An interesting example of what goes on in workplace contexts and how people interact with artificial systems like computers and avatars. What would this imply for virtual worlds? Influencing the Decisionmaker with Neuromarketing. Short PR piece from Zenzi. IRobot, best known for its Roomba floor sweep ing robot, has developed a prototype robot for DARPA that can fit into tight spaces via its morphable form. Robotic forms do not need to be anthropomorphic. More in IEEE Spctrum. A display of changes in social media over time. The specifics are not that useful, but it is an impressive representation of how many people are engaging with social media. A good post on the high ROI for data mining in innovative organizations. Contains a good set of examples that have worked in this space that are instructive. It is always best to know what you are looking for. Retailers discover differences between IPhone and Blackberry users. By Evan Schuman in Storefrontbacktalk. 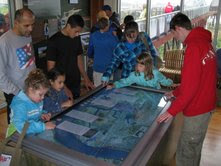 This blog emerged from connections nurtured at our innovation centers. One of the topics we covered for years was how to talk to the shopper as they roamed the aisles. It has covered topics like smart carts, specialized hand-held devices, simple cart handle displays and most recently shopper-owned cellphone applications. One of our longest connections started with tests originally done with Motorola that we did with shoppers in the early 00s. 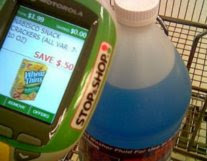 Early on these and similar devices, now being used in 260 stores, were mostly used for self-checkout and information delivery. The ultimate goal for any of these solutions is to do real-time data mining based on both the immediate behavior of the shopper and their historical purchasing actions. Huge opportunity for mining analytics, from simple to sophisticated. It seems we are getting closer to the ability to do that in real contexts. The successor of this work is outlined in a Technology Review article that breaks open the Modiv Media device that is a successor to those tests. Includes a view of the hardware involved that is revealing. Much more to be done, follow this space for more information. BusinessWeek short video and article: Inside the App Economy. Great introduction to the whole notion of both mobile and social networking applications. More about reaching the customer than I had imagined. Money is being made. Content is no longer king, or at least you can't often charge for it. So is community king now? So says Judy Shapiro in AdAge. That has been true for quite some time. Only a few examples of for-fee distribution of knowledge itself still thrive. Though if you want to build a useful community as she suggests you still need some knowledge to get things started. And well written information that can be applied to real problems is still the best way to do that. Journalists and writers will still be needed. Mike Cristiani of MIG points out that the book: The Elements of Statistical Learning: Data Mining Inference and Prediction, by Hastie, Tibshirani and Friedman Second Edition.is available free as a PDF. Based on a scan this is quite technical, but also a good breadth of applied topic coverage. An education oriented site and mag whose tagline is: Education is Destiny. WIMI, The Wharton Interactive Marketing Initiative reports that they have established a partnership with ESPN. Press release and details here.
' ... Talisman developed the interactive applications and they use our Runtime Client and mCast Digital Signage Management System on each of the Messengers. The systems are being remotely monitored and managed from our Westerville Support Center. The application features gesture controls similar to what is used on an iPhone. Contact MCosm for more information about their expertise. In an ongoing progression, more of the web has become searchable. Google has announced that Twitter updates will soon be added to search results. How will they be ranked? Starting this week Bing has also added a Twitter search capability. Watch what you say. Update: More about this in AdAge. Ontology is one of those words that you do not hear in common parlance. As a result it often gets a blank stare if you dare to use it in management meetings. I have been there. You can probably understand that when you notice that its definition starts as proclaiming it as a 'branch of metaphysics .... '. If you delve into any intelligence work ontologies are key tools because they can be used to structure knowledge we commonly understand and reason about. We use them all the time. IEEE Computer has an excellent post that explains them. In the spirit of Web Squared, Wowd is a search engine that seeks to get 'fresh real-time results'. See also their blog. Heard it described at the Web 2.0 Summit. They position it as an instantaneous popularity measure. I am rarely in need of popularity as a measure, but rather the quality of a search result. It will be interesting to see the difference between the two measures in practice. It was not obvious from a few searches I did. The Web TV Summit is underway and its live video stream can be accessed here. Interesting speakers on the topic, including Berners-Lee. I believe it will be archived in full. I remember the idea being pushed back in 2007. A set of GPS enabled shoes. Reading Information Dashboard Design: The Effective Visual Communication of Data. by Stephen Few. Very good. See also his blog: Visual Intelligence. I abandoned SL about a year ago after over a year of exploration. Is it now crowded and profitable? People spending 100 minutes of time there per visit on average? I saw my enterprise build a space, I watched some very large companies build theirs presence. As an avatar I chattered with developers and managers there. I attended a number of meetings. It is still an interesting idea, but very clumsy and inefficient to get anything at all done. You could establish a new life, but only by largely abandoning your first one. Waiting for a reason to take another look. One of my particular interests, starting at enterprise innovation locations, was to experiment with how a shopper could engage with retail locations in a seamless and useful way. I experimented with several applications that did this, both before and after the emergence of smart phones. Making and sharing a shopping list has never been easier. Or more convenient. WolframAlpha, the computational knowledge engine, has an application for the IPhone. What has received much of the early publicity is that it is expensive in the odd expectation world of the App, where many excellent and some extraordinary free apps make everything seem inflated. WolframAlpha costs $50 and that's infinitely more than free. I have seen myself hesitating about buying $0.99 applications. There is no logical economics here, or perhaps anywhere. Check out free Wolframalpha on the web first. I have long been interested in using games for serious learning. Doesn't it make great sense to use the fun, competition and often addictive nature of the game to help people learn and master complex tasks? Yet despite the obvious application of the idea, you see relatively little of it in the enterprise. There is a new book, reviewed here, that addresses the topic. Learnings with Digital Games by Nicola Whitton. It says it is focused on higher education rather than the enterprise. It is on my list to read. Other suggestions in this area? Brand damaging activities in social networks. An update in Computerworld with a number of useful examples. Comments here are moderated. I usually get to them very quickly, but depending on my schedule may take up to a day or two. Comments also need to be on relevant. I will not approve those that do not make a useful point. Also, regrettably, I cannot approve comments in languages I do not understand. Please submit them in English or German. E-Commerce Times article. Suggests based on Gartner and other reports that investment has flatlined in SCM. Somewhat difficult to believe, given increasing cost pressures. Can we replace an old system with a much faster and reliable one? 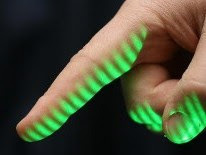 Good overview, with a number of advantages over the old fingerprinting method. Some start ups working in the field, such as Flashscan 3D, which uses a method known as structured light illumination, shown at the right. Also a comparison to other biometric methods. Lots of work to do to get to change all the systems that currently exist. It was implied in a previous post that Microsoft did not intend to have the life blogging camera Sensecam produced. It was just reported that the camera will be manufactured, primarily aimed at mental health applications. A early version shown at the right, made famous by their MyLifebits project. We examined these for potential knowledge capture applications, though since then camera phones provide similar abilities to what we were looking for.
' ... Now Vicon, based in Oxford, UK, which specialises in motion-capture technology for the movie industry, has licensed the technology for the camera from Microsoft and intends to put it into large-scale production. Forthcoming: Google Editions. Now that Google has been given the open ability to scan books in the public domain, it is only natural that they are looking at ways to deliver books to multiple kinds of readers. Even as a form of universal source, in which they could dominate. Here is an indication that they are moving in that direction. Not surprising. I like it, but I remain nervous about Google controlling too much media. Related, the place of libraries in a digital world. Should libraries be able to distribute e-books? Have worked for and with libraries, and I think so. A very good how-to article about the process of experimenting with Amazon's Mechanical Turk system. If you don't know about Mechanical Turk, it is one of the longest running experiments with public crowd-sourcing. Open to anyone to participate. There are currently over 28,000 experiments, or Human intelligence tasks, underway. We conducted a number of experiments with the system. The article covers a number of pitfalls we encountered, and some we did not. From Dr. Markus Jakobsson, a principal scientist at PARC. Richard James sends this along: "...The extraordinary true story of a Malawian teenager who transformed his village by building electric windmills out of junk is the subject of a new book, The Boy Who Harnessed the Wind..." In the BBC. And the blog about his book. Storefrontbacktalk reports that Tesco has a system to let shoppers find items in its 3700 plus stores using their IPhones. But they are not providing local WiFi, so there is potential for weak mobile signals. I do not agree that is a major outage, it provides value on the shoppers device, which is in the right direction. The path for improving it is there.
' ... The Data Mining Group (DMG) is an independent, vendor led consortium that develops data mining standards, such as the Predictive Model Markup Language (PMML). A presentation on the subject. And an analyticsbridge discussion group on the subject. Google has recently added a toolbar capability called Sidewiki, which allows anyone to add comments, information or respond to any site. Previous attempts to do this kind of thing have not worked well. Pharma and other enterprises are required by regulations to take any comments, no matter how wacky, seriously. A recent AdAge Digital article does a good job of laying out the concerns. It is unclear if such methods will be widely adopted. I see that TDWI has added a number of new white papers, case studies and other resources on Business Intelligence as a service, have not begun to tap their sources. You will recall I took a first look at BI SaaS recently with the Clario system. I still recommend Linkedin first for people that are new to the use of social networking in business. Yet it is not open in the sense of being able to easily get information to other applications. In fact in the few conversations I have had with them it seemed that they were most interested in selectively leveraging their own information and not at all interested making it sharable. A new piece in ReadwriteWeb talks about this, and a Linkedin VP chimes in to say that their APIs will be improved. Exactly how is still unclear. The Times of London looks at Martin Lindstrom's view of how to do product placement right. American Idol experience used as an example for the application of neuroscience principles. Subscribe to his newsletter. I see that Ekahau, whose specialty has been WiFi based location methods, has come out with a wristband format tag that has meter and less accuracy. We looked at these methods of tracking in innovation center and retail contexts. Obvious applications where WiFi is present and where real time accuracy and reliability are required. Just reacquainted myself with their site, which is useful. I finally took a look at the Redlaser barcode scanner from Occipital for the IPhone, released earlier this year. It is a $1.99 application that downloads quickly. It uses the camera on my 3G Iphone and then interprets that picture as a 1D barcode. I have previously looked at a number of proprietary 2D, camera-based readers for cellphones. This one interprets standard codes found on most products. (UPC and EAN) It can then be used to search for that product to find more information or alternative prices. Or save a list of products scanned. I tried it on a dozen or so consumer products that I am familiar with and some other items like books. Worked OK, but required you to get close to a product, and hold the camera still while it scans. It worked well if I could easily orient the phone view with the package barcode. In use at the shelf that may be difficult. Or in a situation where I need to pick up the product to scan it. It did not work for upside-down or difficult to orient situations. Also the amount of light available seemed to alter its accuracy. You don't have to take a picture, it scans when it determines it is properly oriented. In the site video they pre-oriented products to work easily. Bottom line, its a great idea, works with some effort, but don't expect it to work practically in its current form for scanning purchases as you put them in a cart. A typical shopper would not accept the difficulty. It has to work very quickly and reliably. Would work if you are scanning one-off, expensive purchases that may have lower prices in another shop. More technical details on their blog including SDK information. I used Bing a number of times in comparison to Google search, but then stopped. Word is it is doing better that expected. Will give it some more tries. Idea Connection sends along a link to word of a Flu-Fighting business suit. Treated, it says, to kill the H1N1 virus. I have considerable doubt. I mentioned my examination Google's look at structured data some time ago. They have recently announced some improvements. Not much like WolframAlpha, but sort of a table extract search. A few quick looks shows far less in the way of nonsensical results, more useful results and sub categories. It is complete more often, but you cannot trust it to be complete. It only shows twenty US presidents, for example. You can now export the results to spreadsheet and CSV files, and sort them, which is useful. We need something that bridges the world of structured vs unstructured data. That would require the inclusion of more semantic information about what we are searching for. WolframAlpha is one direction, though it still reaches beyond its grasp. There are now over 18,000 public domain (free) reads for the Kindle online. In addition Sony eBook readers can access Google's massive collection of scanned public domain works. Nice direction for mobile accessible texts. I don't have a Kindle device, but have used the IPhone Kindle reader. Continuing the topic of chart simplicity and understanding, Junk Charts looks at four charts of economic data and how they can be compared for impact and understanding. Has some useful links to other resources that I am exploring. A number of interesting visualizations of data. 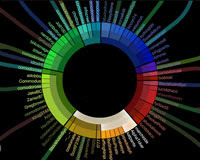 The original piece is 50 great examples of data visualization. There is no doubt that these are colorful, finely crafted and complex. They are worth looking at as examples of how data can be organized in new ways. But are they 'great'? I can see at least a few that could be replaced with simple bar charts. I am a proponent of simple is better and if I a trying to create something that leads me to interact with data, rather than attract me to the data, many of these go over the edge. If you are trying to attract someone to the fact that there is a problem, ok, but it is less useful if you are trying to solve the problem with the visual. Caution, visuals should be only as complex as they need to be. In Forbes an interesting piece on bioethics and neuroscience topics: Is My Mind Mine?. The author Paul Root Wolpe, .... is editor of the American Journal of Bioethics--Neuroscience, and is past president of the American Society of Bioethics and Humanities.
. ' ... I’m not talking about science-fiction fantasies, like a food-on-demand machine: punch a button labeled “Caesar salad” or “ice-cream sundae,” and the machine fulfills your wish by assembling your order from molecules. (Incredibly, there has not been much progress on this lately.) More realistic, if barely, is the truly automatic, robotic, voice-operated food chopper. (“Remove carrot from fridge, please, peel, chop, thank you very much.”) We seem no closer to truly helpful robots than we were when I used to crank a toy version of Robby around my bedroom. I tried the free Adobe image-editing offering for the IPhone today. Its a simple set of touch-up capabilities for your pictures. Its the kind of capability that you now expect to have included in any free photo editing capability. It is not comparable with Photoshop or Gimp in any way. Thought Adobe could have been more distinctive and useful without endangering their other offerings. It is worth the price for simple mobile touch-ups, which can be useful if you do much MMS. It has been pointed out that Phanfare and Smugmug have similar offerings. SNCR and Deloitte announce the following study of interest, Includes downloadable study and a link to an upcoming webinar on the topic.
' ... Deloitte LLP’s Technology, Media & Telecommunications (TMT) practice has recently released the results of the 2009 Tribalization of Business Study, which evaluates the perceived potential of online communities* and identifies how enterprises believe they may better leverage them. Conducted in conjunction with Beeline Labs and the Society for New Communications Research, this second edition of the Tribalization of Business Study measured the responses of more than 400 companies including Fortune 100 organizations which have created and maintain online communities today. On of the most contentious issues for studies in the newly emerging field and business of Neuromarketing is sample size. Generally marketing analyses that attempt to understand large populations by sampling utilize hundreds of individuals. NM studies are usually far smaller yet there is clearly variation among the reaction of respondents brains to stimuli. For reasons of cost, there is always pressure to decrease the sample, and in general NM studies cost more per person than classical approaches. Is there something fundamentally more stable about brain studies? Sands Research has put together a good paper on this issue: Sample Size Analysis for Brainwave Collection (EEG) Methodologies, based on their own empirical studies. I invite comments or other references on this issue. In E-Commerce Times. Google had developed a new piece of code for phones with HTTP browsers to allow the display of advanced ads on mobile platforms. Mobile capabilities march on. I mentioned this article some time ago, it was orginally in the Communications of the ACM, about one of the most difficult yet practical mathematical problems of the age. Now the NYT Science section has chimed in with their own short review, which emphasizes its value and also points out its difficulty. Like the CACM article, gives a reasonable introduction to the problem, but does not provide enough detail to show why it is hard. P&G to Launch Custom Beauty Magazine Rouge in U.S.: Package Goods Giant Plans to Build Database by Relying on Mommy Bloggers to Spread the Word. Nice to see bloggers mentioned. A case study of the use of M-Commerce by Starbucks in Storefrontbacktalk. I agree with their comments, I have tried a half dozen M-commerce applications, but have never bought anything with any of them. They are promotions for the store, but don't incent me to do any buying ... Sears, Whole Foods, Dunkin Donuts, Kraft now Starbucks ... not a penny from me. Fujitsu has announced that it has developed a more rugged RFID chip. Based on some of my own recent discussions there are a number of useful applications, for example in military and firefighting. The ruggedness includes the ability to stand higher temperatures and rough physical treatment. In what seems like a small thing, Google now lets you get a quick view of search results, Gmail and Google docs as a PDF. As a result you can preserve more formatting details in many cases. I can recall a number of times when this would have made my life easier. Have followed solar power ideas since the late 70s .... I remember this idea being posed back then. Now it has finally come to fruition. Launching in 2010. About 10% efficiency. ROI will be interesting it will be interesting to see how this will relate to normal re-roofing cycles. Very good. In Forbes: Cheap Entrepreneurial marketing maneuvers for small business, including Twitter use. Have only looked at a few, but some interesting videos from the summit. Are you ready to be uploaded? The concept of a technological singularity continues to intrigue me. I remain skeptical about its near-term occurrence. Richard James sends along a link to a very detailed article about Tesco in the US: RETAIL CASE STUDY: ANATOMY OF A TESCO FRESH AND EASY NEIGHBORHOOD. Much written about but have yet to visit one of these. They conclude: ' ... The success of these stores will hinge partly on Tesco’s execution and also on other factors like whether consumers from lower income families will actually be willing to pay the higher price that will inevitably result from better quality food and also operational issues and costs that may result from having stores in under-developed neighborhoods ... '. The Metriscient site is also interesting by itself, a pro bono site about basic analytical methods. Seems to be good for educational case studies. Good to watch. Correspondent Sy Truong has just had an Iphone App called BI Flash approved. It allows you to deliver SAS reports and data to the IPhone, enter parameters, capture real time data on your Iphone ... and more. Mobile BI, which is a good idea for retail, for example. You need a recent version of SAS running on a server to connect to. I don't have that so I cannot test directly but there are lots of data and reports to check out when you download the free app. Nice idea. More details here. Good, short, non-technical video all about Google Wave. Also, Businessweek asks if it will replace E-mail and Facebook. A $1.99 IPhone App called IP Camera can take a picture every 12 to 15 seconds and then posts the picture to a local network via WiFi. Effectively a security camera. Some limitations, but a nice direction. CNet review. Roger Dooley suggests that the recent mention of using brain scans to provide accurate and specific predictions for scary movie content really shows a further failure of focus groups. Will the emergence of the understanding of the non-conscious via neuromarketing ultimately lead us to greatly diminish or eliminate the use of focus groups? As I continue to learn more about this area I am inclined to think so, though there is still much work to be done. Steve King writes an excellent blog: Small Business Labs on small business and entrepreneurial topics that is useful. Notable is a recent article on the increasing use of cellphones as 'remotes' for our daily life, including useful usage statistics. Good blog to follow in general. Paid online traffic appears to be down about 26%, A very cursory look at the data looks like it is a significant change beyond normal and seasonal variability. Implications? See the comments of the post linked to for some suggestions. I worked on a project that helped Procter executives relate and visualize compensation to dividends. It was the first PC based program that execs used directly. I was reminded by a Motley Fool article that I saw today: ... Impressive. Dave Knox posts on new experiments by Procter with online soap. Links to another local article on the change. Outlines some of P&G's goals. One of the world's largest advertiser and marketers took it from paper to radio to TV ... and now to the Internet? With the emergence of popular book readers will will we start to see increasing book piracy? In the NYT ' .... The Association of American Publishers estimated that these hardcover sales in the United States declined 13 percent in 2008, versus the previous year. This year, these sales were down 15.5 percent through July, versus the same period of 2008. Total e-book sales, though up considerably this year, remained small, at $81.5 million, or 1.6 percent of total book sales through July ... . Artificial intelligence and consciousness at the singularity summit. This is still a long way off. Download Squad mentions a little mashup utility that lets you quickly get latitudes and longitudes for a place name. Used it some time ago and was glad to be reminded of it for an upcoming effort. Good Businessweek piece : Can Google Stay on Top of the Web? As Bing, Facebook, Twitter and less well-known upstarts nip at its heels, Google has hundreds of wizards racing to come up with smarter answers. Their new Wave package bears looking at. They always have the option of buying, and in some cases it surprises me they have not. For those of you who do not follow Google competitors for attention on the web, and this is beyond just search, this is a good overview. One of the comments in the thread there points to the fact that there are very few CKOs around. There was an attempt by the library systems to create a form of BIS or Business Information Systems to act as a nexus for knowledge. Legal covered areas like intellectual property. The CIO headed the acquisition of software and hardware to manage the increasing amount of knowledge and making it available. This because more complex post web, when the availability of knowledge sources exploded. The CEO and other executive teams linked to specific problems. When the Web and search emerged, it was quickly seen that employees needed to see the external web, plus have a secure intranet for internal knowledge. Like secretarial skills, the whole idea of knowledge management became do-it-your-self, and largely very inefficient. Wikis were tested as crowd sourced knowledge management alternatives, but still rarely used. It continues to evolve today. Cart mounted shopping devices continue to be tested. Here again the Concierge device, previously reported on here, is in limited time test at Food Lion's Bloom stores. It is advertised as a ' ... GPS for your shopping cart ... ' . I participated in a number of tests and demonstrations of the overall concept as early as 1999. The idea mixes consumer convenience and the potential of marketing focus to shoppers. There still appears to be only sporadic interest in the idea. Cost, consumer interest and data management are still issues. I thought that the increasing use of self-checkout would open up this idea as well, but it still has not happened.